The Sincere Respect Bouquet is a soft and lovely way to express your condolences for your special recipient's loss. 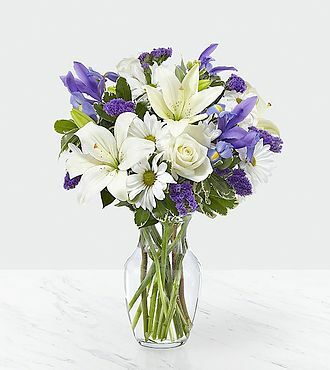 Blending together white roses, white traditional daisies, and white Asiatic Lilies with pops of blue iris and purple statice, this gorgeous bouquet is set to offer wishes of peace and caring kindness during this time of grief and loss. Presented in a classic clear glass vase, this fresh flower arrangement is a wonderful way to commemorate a life well lived. STANDARD bouquet is approximately 17H x 13W. DELUXE bouquet is approximately 19H x 15W. PREMIUM bouquet is approximately 20H x 17W.